Priyanka, who reached Varanasi at the end of her three-day journey along the Ganga, told the media that the BJP-led government has "systematically attacked every institution in the country", including media houses, since 2014. Hitting back at Prime Minister Narendra Modi for his blog post stating that people in 2014 voted for honesty over dynasty, and that national institutions were the biggest casualty of dynasty rule, Congress general secretary Priyanka Gandhi on Wednesday said that the Prime Minister “should stop thinking that people are fools and understand that they see through all this”. She later addressed a meeting at Varanasi’s Assi Ghat and interacted with boatmen, who form a sizeable chunk of the electorate, asking them to vote for the “right party”. She also addressed party workers at a private guest house in Varanasi and met family members of CRPF personnel from Varanasi and adjoining Chandauli district who were killed in the Pulwama terror attack. Modi is an MP from Varanasi. She asked people to tell the “arrogant leaders of BJP” that they want new politics and a new government and promised on behalf of Congress president Rahul Gandhi a separate ministry for fishermen when the party forms a government at the Centre. Earlier in the day, Priyanka visited the birthplace of India’s second Prime Minister, Lal Bahadur Shashtri, in Ramnagar area of Varanasi and garlanded his statue. With a section of BJP supporters shouting slogans of “Modi, Modi” during Priyanka’s visit to Ramnagar, there was a brief clash between BJP and Congress workers. In a similar incident, before Priyanka arrived at Assi Ghat, a girl wearing a T-shirt with “NAMO” written on it, was heckled, allegedly by Congress workers, when she started giving statements against the Congress to some of TV channels. The police intervened to safely take the girl out of the melee. The girl maintained that she is a student, and that she has the right to wear any clothes she wants. Later in the day, Priyanka went to Varanasi’s renowned Dashashwamedh Ghat and performed Ganga aarti and holika pooja. 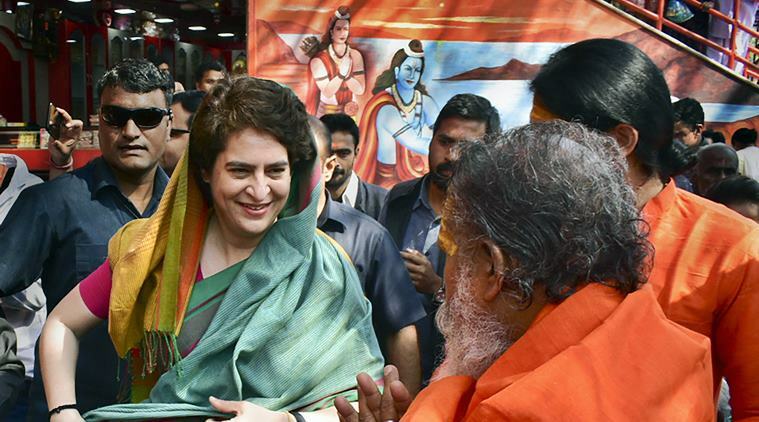 She also offered prayers at Vishwanath temple.